Photo shows San Francisco Giants second baseman Joe Panik speaking with fans and signing autographs at Macys Union Square on Nov. 1, 2014, the day after the World Series Parade. Panik, who turned 24 the day after the win, hit .305 for the season and made some big plays at second base during the World Series. He says he’s looking forward to spring training in Scottsdale in late January. On October 29, 2014 in game 7 of the World Series, the Giants beat the Kansas City Royals 3-2 to win the series. In the bottom of the third inning with a runner on first, Panik made a diving stop on a ball up the middle and flipped the ball with his glove to shortstop Brandon Crawford to get the lead runner out. Crawford then threw to first to try and get a sliding Eric Hosmer out. Initially, Hosmer was called safe on the play but after a three minute replay review, the call was overturned for the 4-6-3 double play. It was the first ever overturned call in the World Series since the replay review system was implemented and the double play was regarded as one of the most spectacular plays in World Series history. The MVP of the series was Madison Bumgarner. Panik was praised for his calm and collected play during the 2014 postseason, the biggest stage in baseball, atypical of a young rookie. Sports Speakers 360 is a booking agent for pro athletes. 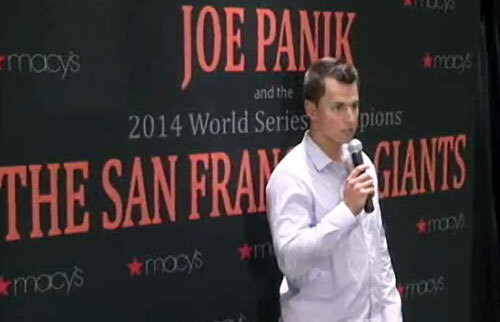 If you would like to book Joe Panik for a speaking engagement, appearance or endorsement, contact Joe Panik’s booking agent for fees at 1.855.303.5450.